← Abbey can Make Rice, using Proloquo2Go on her iPad mini! Wahoo, Go Abbey, Go! Cases for iPads and iPad minis, which one for your kiddo, Griffin or Otterbox? Boy, let me tell you! I want to share our experiences with cases to save you guys some money as I know many of you are looking for that case that’s going to save your kiddo’s iPad, but which one? The contenders seem to be the Griffin Survivor (or link for a black one) and the Otterbox, from what I have seen and heard. They both claim to do a great job protecting against lots of wear and tear and both come with stands. I have a purple Griffin case. I teach students with autism, and also work in homes with students who cannot attend school because of illness. I’ve been using my iPad with them since I purchased it, though didn’t get the Griffin case until one specific student accidentally pitched my iPad across the kitchen. It is amazing! I admit the tab over the camera is annoying, but none of them have come off. My other annoyance is that I often hook my iPad to the whiteboard in my classroom so we can all use it, but I have to take the case off for the adapter to fit. Beyond that, the case is fantastic! I also do disaster services work for the Red Cross, and have taken my iPad with me… No issues. One student has the Otterbox case, and we are always having problems holding it, making it stand, etc. I’m so glad it’s working out better for you. Wonder if the version you have is the same, is it for the newest iPad mini? My daughter couldn’t do much, in the way of pressing, doing puzzles, etc.. on it without the stand falling over all the time. 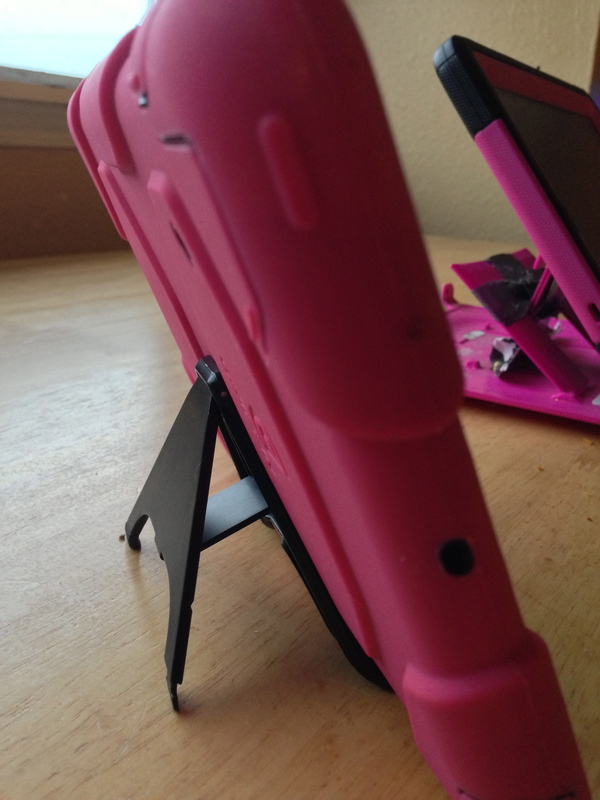 The newest version of the Otterbox for the iPad mini has the most amazing stand…essential for my daughter. Also, the stand also serving as a protective shell to pop on the front when she puts it in her purse, to go to stores, etc…really keeps the screen safe, another essential for us! :) Thanks! Yes, Pictello is amazing, Abbey does well with this app as well!